- The letters of the alphabet, cut out of sandpaper and mounted on thick cardboard on wood. a. The consonants are mounted on pink boards and the vowels on blue boards. - Sixteen green boards on which are mounted the double sandpaper letters, representing “key” sounds (phonograms) not covered by single letters of the alphabet. Decide on a script. Consider the one used in the elementary school system if most children will be attending. If possible, use display ledges for storing the letters rather then keeping them in boxes one behind the other. This helps to arouse interest, reinforce visual impressions, call attention to the totality of graphic symbols, and encourages the child to do more. Observe dexterity and the arrival of focused attention in the child’s Practical Life and Sensorial work as readiness for the Sandpaper Letters. The Sound Games are the prerequisite for the Sandpaper Letters. The child must be familiar with all sounds in the dominant language of the cultures. Word analysis can be competed parallel to Sandpaper Letter work. With readiness the pace of this work moves steadily along. Most children will learn all their letters in about a month. Always present the letters at a table. Teach the letters with a Three Period Lesson. Give individual presentations for the initial work. Later group names can be used to reinforce the earlier experiences. After the first presentations, continue on consecutive days. Sometimes a child may have more than one lesson on the same day. Before presenting new letters, review those previously given and do further work with any that need it. Choose three letters of contrast both in shape and sound for presentations. For the very first experience by the child choose a sound that is of some special interest to that individual such as the first sound in their name. Include a vowel in the early groups of letters presented. Introduce a phonogram by the fourth presentation. The child will get both visual and kinesthetic impression of each letter. In some children the muscular memory of the letter will be stronger than the visual memory. Repeated tracing of the letter is therefore very important. With each repetition the sound is also given so the auditory connection is deeply established. Present different letters to different children to stimulate interest for all. Return the material to the shelf. Bring them over to the table and sit with the child. Place the three letters upside down at the top right of the table. Conversationally introduce one letter. If there is a personal connection to the letter, say it. Steady the tablet with your left hand. Using your right index and middle finger, trace the letter. Trace and say the sound two ore times. Then have the child trace the letter three times, saying the sound after each trace. Then place the tablet face up in the left corner of the table. Introduce the second letter in a similar fashion as the first. Trace this letter as with the first. Repeat the same steps as with the first tablet for the second and third letter. Continue with the Three Period Lesson. Be sure to include the tracing of each letter in the 2nd and 3rd Periods. Once the child is done, replace the tablets and repeat this lesson on consecutive days. Be sure the child is secure with the letters before adding others. Continue this lesson until the child has completed all of the letters. The child works with the letters he knows as shown in the presentation. Start the presentation as in Presentation 1 but you will now be working with three children. Choose three letters for each child. Place the three letters in front of each child in a row. Then the letter is passed around to the other two children who trace it and say its name. Then it is given to the directress who places it upside down in front of her. Continue in the same way until all the letters have been traced. Each child puts his tablets away. This is to be done with three children. Choose at least nine letters. Make sure at least one of the children knows all of the letters. Place them face up, in no specific order, in front of you but in the child’s direction. Then give the letter to the directress who places it upside down and away from the others. Repeat until all of the letter have been chosen. Trace the letter in the air and have the child say its sound. Trace the letter on the child’s back and have them say its sound. Trace the letter in the child’s palm to have him go get that specific letter from the box. - To unite these sounds by means of muscular and visual memory to the appropriate symbol. In the sandpaper. If the child's fingers slip away from the sandpaper he notices the different feeling by the surface. Keep individual records of letters learned. Plan on ongoing letter work for each child. Include individual presentations as well as reviews and practice in the group games. Some children need long and repeated 2nd period work. This is often the case who enter the class late (after the age of three) and haven’t had time to prepare readiness fully through the Practical Life and Sensorial Exercises and the Sound Games. These children may need several first and second period experiences with the same letter before they can succeed with the third period. Use a game of slow motion speech for help with sounds. Say the sound the entire time the fingers are tracing a letter. 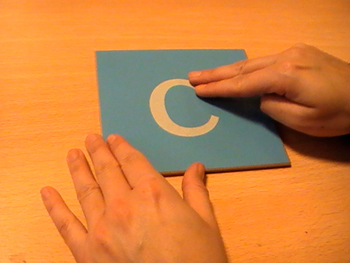 Give the child’s hand a piggy back ride on the teacher’s hand as the letter is traced and its sound given. This Montessori Video shows how to present a child with the Sandpaper Letters.